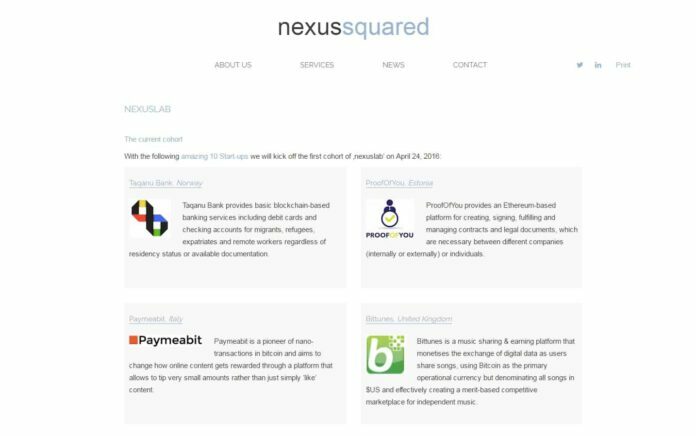 Nexuslab, the Swiss Blockchain startup programme powered by Startupbootcamp Fintech, has announced the ten international startups selected to join its pilot programme starting this April. The selection reflects a broad range of industries bound to be affected by Blockchain technology innovations in the near future. The finalists include teams from across Europe and have been chosen by a panel consisting of Nexussquared management and industry experts, including representatives from Startupbootcamp and its network partners. In view of the vast opportunities that Blockchain technology offers, the jury’s aim was to compile a diverse group of startups featuring young entrepreneurs from different industries and countries including some very early stage ideas. On 24 April, the nexuslab pilot programme will kick off with a weekend hangout session in Amsterdam featuring a series of initial workshops based on Lean Startups and Business Model Canvas methodology as well as events to foster the community of participating startups. Together with an extensive network of international mentors across industries and disciplines, the Nexuslab team will work with participants to prepare them for the final month of the programme, which will be hosted at SwissQ in Zurich. During this final stage, participants will receive further coaching to get them ready to present their products to an international group of investors, company representatives and the wider public at the Nexuslab Festival Day on 7 July 2016 in Zurich. Bittunes is a music sharing & earning platform that monetises the exchange of digital data as users share songs, using Bitcoin as the primary operational currency but denominating all songs in $US and effectively creating a merit-based competitive marketplace for independent music. Doqum.io is a secured cloud storage service and allows its clients to access a single storage account for all their documents from various providers. 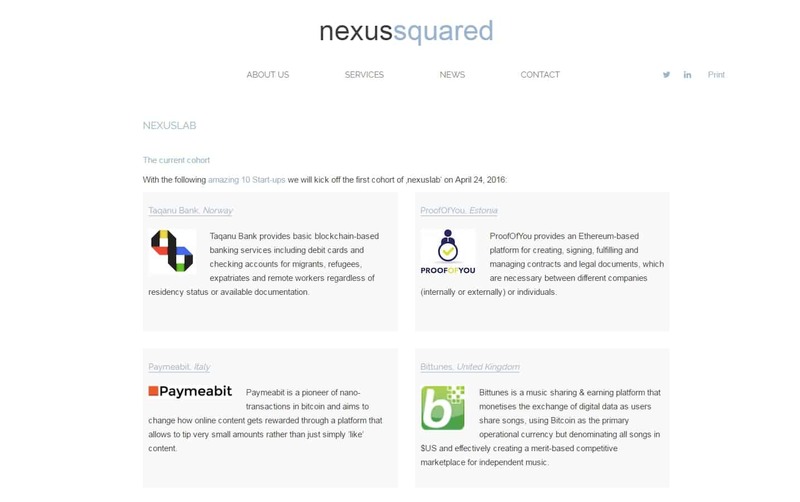 Blockchain technology is used for document-tracking and user authentication. First Wallet is a unique mobile wallet that gives every smart phone owner the possibility to make instant bitcoin payments without any exchanges or money transfers in a highly secure environment. Magic in Bits provides an active layer of defense for businesses, utilizing Blockchain and applying multiple techniques in their engine such as attack pattern detection, behaviour analysis and a tight business logic integration based on the business baseline and policies. Paymeabit is a pioneer of nano-transactions in bitcoin and aims to change how online content gets rewarded through a platform that allows to tip very small amounts rather than just simply ‘like’ content. ProofOfYou provides an Ethereum-based platform for creating, signing, fulfilling and managing contracts and legal documents, which are necessary between different companies (internally or externally) or individuals. Taqanu Bank provides basic Blockchain-based banking services including debit cards and checking accounts for migrants, refugees, expatriates and remote workers regardless of residency status or available documentation. SolarChange is a Blockchain-based platform, which creates a financial incentive for producers and supporters of solar energy, offering advanced monitoring services and enabling the use of SolarCoin – a new digital currency. Wone makes payments across different mobile wallets possible through an interoperable Person-to-Person mobile payment solution in Europe. This allows anybody to send money to their friends even if they don’t have the same mobile app. Yope delivers decentralised applications built on top of the bitcoin and Ethereum Blockchain. Their ‘Safe Bike’ application allows users to register their bicycles on the Ethereum Blockchain at the point of initial purchase in a global, immutable register of ownership.